Expresso took a Sho’t Left from Jozi and discovered that just an hours drive from the city lies the Cradle of Humankind World Heritage Site and close distance from that Magaliesberg whose canopy tour will get your heart racing! The maximum slide of 240m between two man-made platforms is steady and controlled by your own pace from fast to stead cruising. This day tour complete with all equipment (helmet, harness and gloves) - your experienced guide accompanies you between the platforms to ensure your safety and enjoyment. Groups are welcome and so are singles, refreshments are catered for and included in your aerial adventure lasting an hour is plenty of laughter, joy and sensational views! 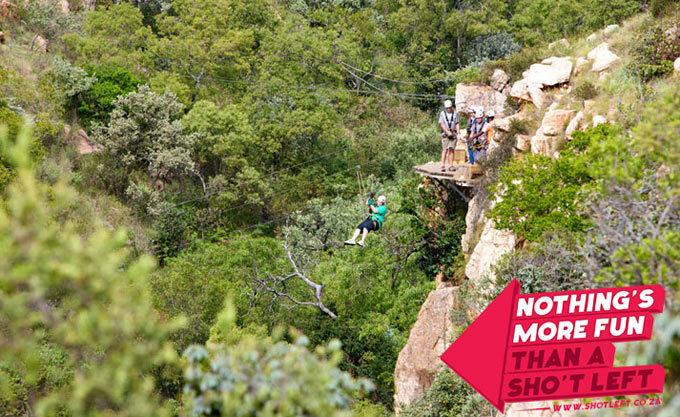 R400 per person will get you the experience as well as a meal voucher to be enjoyed at the on-site restaurant! Don't delay - weekends fill up fast! The Cradle of Humankind is one of eight World Heritage Sites in South Africa, and the only one in Gauteng. It is widely recognised as the place from which all of humankind originated. The 47 000-hectare site has unearthed the best evidence of the complex journey which our species has taken to make us what we are – a place of pilgrimage for all humankind. It is not only a place of ongoing scientific discovery into our origins, but also a place of contemplation – a place that allows us to reflect on who we are, where we come from and where we are going to. The Cradle of Humankind World Heritage Site has become a major international tourism destination with a total of 387 tourism attractions including 91 graded establishments. There are 175 places to stay and 113 restaurants in and around the area to choose from.